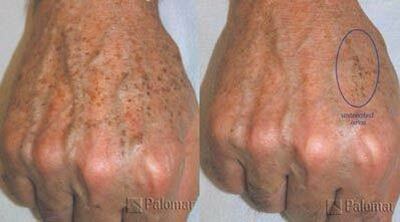 Sun damage over time causes damage to the skin. One of the first signs of this damage is discoloration of the skin with brown patches and spots. Dull texture is also an early sign of sun damage and aging skin. Wrinkles are next to appear: first, with movement of facial muscles, and then progressing to wrinkles at rest. There are currently several different laser procedures available to effectively treat sun damage and wrinkles. At Cosmetic Dermatology and Laser Center, we can recommend the best treatment for your skin's particular needs. What does the Palomar Pulsed Light System® treat? What body areas can I treat? Many different areas of the body can be treated including the face, neck, chest and arms. The number of treatments depends on the individual, the condition being treated, and the location of the treatments. The average number of treatments for most patients is 3-4 treatments. A more advanced level of pulsed light photorejuvination can be obtained for individuals with greater sun damage by using the Palomar Pulsed Light System® with a more intensified technique known as photodynamic therapy. Benefits not only include enhanced treatment of sun damage and pigmentation, but also improvement in skin texture as well. Fewer treatments are also generally needed than with pulsed light treatment alone. Photodynamic therapy may be performed with several different lasers or light sources including Blu-U® (blue light), pulsed light or the V Beam® laser. Photodynamic therapy provides a comprehensive treatment for sun damage, acne and pre-skin cancers (actinic keratosis). A medication called Levulan® is applied to the skin by our medical staff and is allowed to absorb into the skin for approximately one hour. This medication is a topical light sensitizer and becomes activated by the laser or light source. What can you expect after your PDT treatment? After the treatment, you will be asked to completely avoid the sun for up to 48 hours to prevent a sunburn risk. Following your PDT treatment, your skin will appear red and swollen, and some light peeling may follow for up to one week. The time for recovery from the treatment depends on the type of treatment and the severity of the condition being treated. How does PDT help treat sun damage? Photodynamic therapy can be used with pulsed light (Palomar Pulsed Light System®) to not only help treat pre-cancerous lesions, but also to help fade abnormal pigmentation, enlarged capillaries and improve skin texture. Approximately 2-3 treatments may be needed for optimal results. How does PDT treat my acne? When Levulan® is activated by blue light, it aids in the destruction of bacteria that can worsen acne, and it also works to help shrink the oil glands in the skin. It is recommended most patients receive an average of 3-4 treatments approximately 4 weeks apart to achieve optimal results. PDT can be used to treat acne that is not responding to conventional treatment (oral and topical medications) or for those who wish to avoid taking internal medications such as oral antibiotics or Accutane. An added benefit of treatment with the V Beam® laser is that these treatments can help fade acne scars while treating the acne. How does PDT treat my Actinic Keratosis? When the blue light activates the medication, Levulan®, it destroys the precancerous cells. Many patients will also see an improvement in skin texture, pigmentation and skin tone. An average of 2-3 treatments is usually recommended for optimal results, and these may be done 4 weeks apart. Most insurance plans cover PDT treatment of actinic keratosis. The Palomar Star Lux 1540® system is a 'non-ablative' fractional laser for skin resurfacing. This laser sends light pulses into the deeper layers of skin while leaving the surface of the skin intact. As a result, there is usually no wound healing and this generally allows for a quicker recovery time. What does the Palomar Star Lux 1540® treat? The Palomar Star Lux 1540® can be performed on most areas of the body including the face, neck, chest, arms/hands and abdomen. Usually a series of treatments is necessary at 3-6 week intervals. This, however, is dependent on the individual and the condition being treated. Often positive changes are noticeable after a single treatment. Again, depending on the individual and the condition being treated, redness and swelling of the treated areas occurs, but typically lessens with a few hours after treatment. The treated skin often has a pinkish tone and may have some degree of swelling for up to 3-7 days. Dr. Hearth and his staff can tell you what to expect in your particular case. The Fraxel Re:pair® laser is an 'ablative' fractional laser for skin resurfacing. Fraxel Re:pair® uses points of light to precisely treat thousands of microscopic areas of your skin. The treatment penetrates deep into the skin to remove old or damaged tissue, stimulates your body's own natural healing process, and replaces the damaged tissue with fresh, glowing and healthy skin. The 'ablative'process removes more damaged tissue in one treatment session, thus maximizing results after only one treatment. As a result of this enhanced treatment, some social downtime can be expected. What does the Fraxel Re:pair® treat? The Fraxel Re:pair® laser can treat many areas including the face, neck, chest and hands. For most people, maximum results are obtained in just one treatment session. Occasionally, an additional, more targeted treatment may be needed to optimize results in areas with more severe sun damage, deeper wrinkles or scarring. Immediately following treatment, you will have some degree of redness, swelling and crusting. These effects may vary in intensity and duration depending on the particular problems being treated and the aggressiveness of your treatment. If you have deeper wrinkles, or acne scarring, more aggressive treatment may be needed which can require approximately up to a week or more of social downtime. A more gentle treatment with less downtime is possible for those with mild sun and skin damage. Dr. Hearth can customize the treatment for your skin's particular needs.